Hollow plastic pillars available in white and ivory. (White pillars are off white to match ready to roll icing). Plastic pillars packed in sets of 4. White Plastic Dowels 8inch. Can be cut to size. 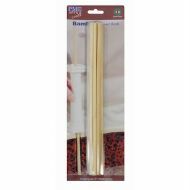 Pack of 12 12" bamboo dowels.